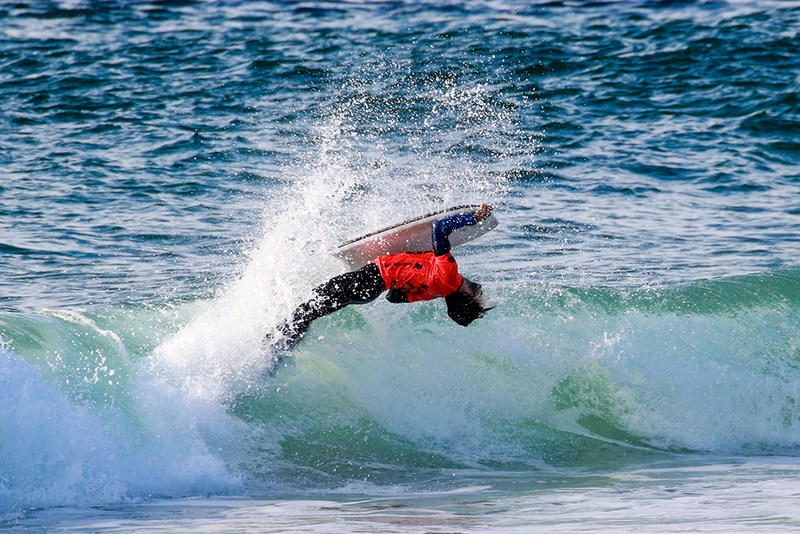 International competitors continued their dominance of the Kiama Bodyboard King Pro APB Grand Slam tour event today at Kiama Surf Beach with the second round of Men’s competition being completed in the tricky two-foot surf. Still leading the pack on the leaderboard is Chilean bodyboarder Alan Munoz who backed up his day-one performance with a handful of stellar rides. So far, Munoz has posted a 7.35 scoring wave, as well as 6.60 and 5.40 to take his leaderboard total to 19.35. Hot on Munoz’s heels was small-wave dynamo Hayato Enokido (Japan) who put on an impressive performance today, bagging himself a 7.00 wave score to push him into the second position on the leaderboard. Enkido remains one of the biggest threats in the small conditions, consistently going for solid maneuvers in the tiny surf. Two-times World Champion Pierre-Louis Costes (France) showed why he was considered one of the world’s best, notching up a respectable 7.25 wave score in the second round. Costes performed an array of aerial maneuvers in the exchange to post the aforementioned score and move from 28th to third on the event leaderboard. David Winchester (AUS) continues to be the best performing Australian on the leaderboard, currently sitting in the fourth position. Winchester only remains two points off the top of the leaderboard, going into the third round. You can follow the competition scores using the Stact app which downloadable in the App Store and also on Google Play. The APB Grand Slam tour uses a unique format where the worlds best bodyboarders surf three times in non-elimination rounds. After the third round, the top three scores are tallied together out of a possible total of 30 points to determine the top 16 to proceed into the man-on-man round four.